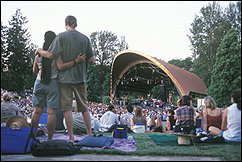 EUGENE, OR (CelebrityAccess MediaWire) — City officials are reportedly looking for new operators for the under-appreciated Cuthbert Amphitheater in Alton Baker Park. The cultural jewel is a part of the Hult Center for the Performing Arts. For the past ten years, the city of Eugene has been managing the shed, but may stop due to economic issues. “We’ve seen a decline in audience, we’ve seen an increase in ticket prices, we’ve seen an increase in artists’ fees,” Director of Operations at the Hult Center, Mark Loigman told the Eugene KVAL 13 News. The city has put out a nationwide Request For Proposal, inviting private companies to apply for the management position. Loigman said the ideal candidate will fulfill Cuthbert’s potential. “I’m hoping that this partnership that we can develop between the city and a management company can really bring it to what it could be,” he said. One company vying for the position, according to the report, is Big Green Events, who organized this year’s Eugene Celebration. “This gives us a good opportunity to try to create a bigger dynamic than what we’ve seen in the past several years,” B.G.E. general manager Bob Jensen told the station. An, he added, he’s got big plans for Cuthbert. “I think it’s a gem. A diamond in the rough. It needs better exposure and a little better connectiveness with the community from all levels.